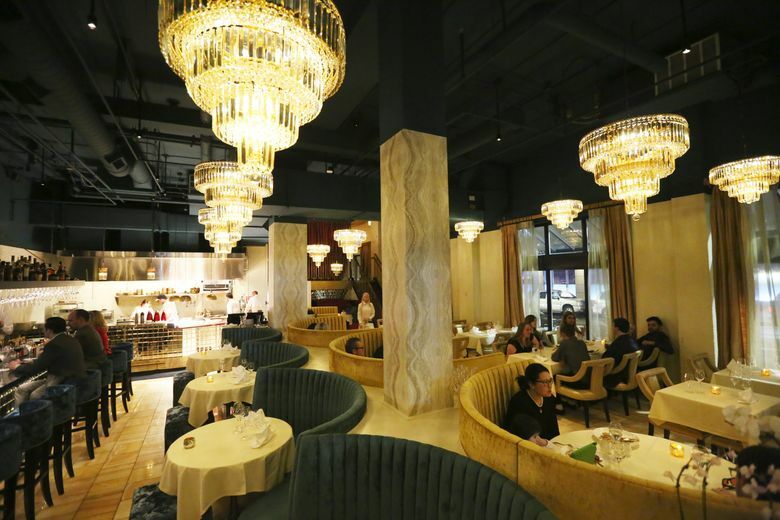 Some dishes dazzle, some fall flat at this new sparkly high-end dining room off Olive Way in downtown Seattle. A sparkling cocoon of crystal and crushed velvet with filmy drapery and ivory napery, Circadia is puttin’ on the glitz like nowhere else in town. Even the plates and the flatware are gilded. I haven’t seen this much shimmer and shine since the last time I saw Vegas. I’m a sucker for glamour. Sipping a cocktail from a vintage coupe glass in the curvy confines of a pleated, high-backed booth speaks to my inner Ginger Rogers. Jake Kosseff, a co-owner of Miller’s Guild, his wife Jeanie Inglis, a winery consultant, and Corry Hart Clayville, a former media executive, conceived Circadia as an upscale alternative to Seattle’s resolutely casual dining scene. Lord knows, this city could use a few more restaurants that restore rather than deplete your energy, more serene dining rooms like this one, where you sit in capacious, cushioned armchairs and conversation flows effortlessly across a candlelit table. I wanted to love Circadia, but widely divergent experiences left me with conflicted feelings. Service was graceful one night, amateurish another. Waiters were either well-informed or clueless. One was so nervous she introduced herself twice, gave us still water instead of the sparkling requested, and asked if I was “still working on that dessert” while I was holding the spoon in my hand. I will never know what “crispy head crumbs” are because she couldn’t tell me and, after closely inspecting my plate of lobster with black squid ink spaetzle and cider-braised squash, said they weren’t there anyway. I chose not to spring for the $125 tasting menu, because all the dishes on it are also offered a la carte. One night the three courses I ordered came to the table at a gallop. Another night, the waiter suggested a thoughtful way of coursing several dishes two of us planned to share and paced us at a pleasant trot. And while there are plenty of three- and even four-digit wines on the bottle list, sommelier Andrew Dombrowski immediately pointed to a red, priced in the mid two-digits, when asked for something versatile enough to span chicken, fish and foie gras. And yet, other dishes dazzled, which is what I expect of executive chef Garrett Melkonian. His perspective is more global here than it was at the Middle Eastern restaurant Mamnoon. He’s fine-tuned his cooking but not forsaken vibrant flavors. He’s even a little playful. 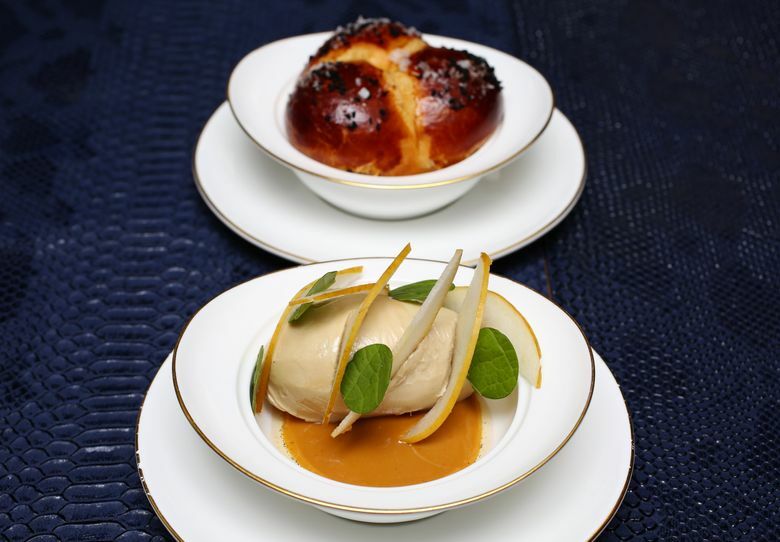 A dessert called “Asian pear dumpling” is actually ribbons of compressed pear, formed into a dumpling-like pouch. The filling is vanilla-and-brown-butter cheesecake. It’s moistened with pear broth, sweetened with sauternes and scented with tonka bean oil. The stunning dish reminded me that Melkonian spent five years as executive pastry chef for Tom Douglas Restaurants. On the savory side, fenugreek sparks a pale cream sauce that drapes a compressed cylinder of skinless chicken breast. On the side was a petite boudin — a savory sausage with a fine-crumb cap of crisped chicken skin. Back-to-back fillets of barely cooked arctic char sandwiched a thin layer of prawn mousseline. 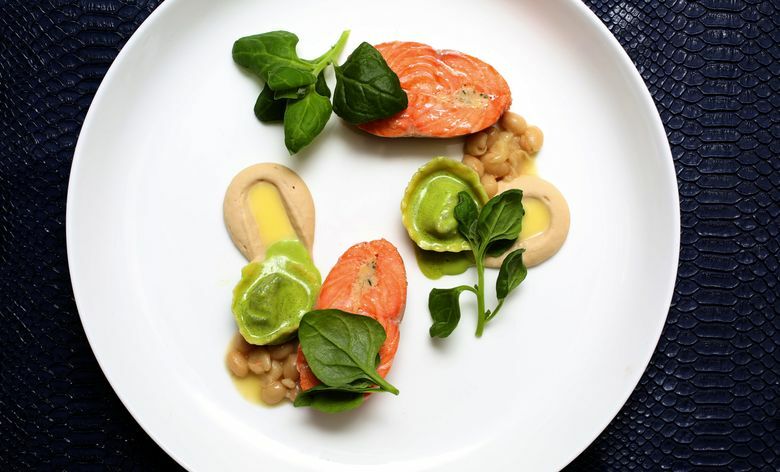 A pair of wheat grass tortelloni and a velvety puree of controne beans dabbed with lemon sauce contributed a hopeful hint of spring. A warm cloverleaf roll, glistening with duck fat and speckled with nigella seeds, comes with the perfect schmear: foie gras mousse with burnt almond butter. Slices of Asian pear and circles of hoja santa, a pungent, anise-y herb, talk the dish down from the ledge of excess. A delicate bacon beignet perched on the edge of a bowl of king crab chowder, one of two spectacular soups, each presented as a tableau-in-a-bowl to be flooded with liquid at the table. The egg-enriched chowder has a bisque-like intensity grounded with dashi and animated with the briny pop of fish roe. The aptly named “Really Good Minestrone” features creamy borlotti beans and fregola sarda, a plump cousin to couscous. The toasted pain au lait provided to soak up the minestrone’s tomato-sweetened garlic and allium broth is from Sea Wolf. The Fremont Bakery also makes the wonderful pretzel rolls, part of a complimentary bread service that comes, oddly, midpoint in the meal. The minestrone was inspired by the chef’s grandmother’s recipe. Grandma might be shocked to learn they are charging $18 for it here. It used to be $22, but late last month, the restaurant dropped its no-tipping, no-service-added policy and menu prices decreased about 20 percent on average. Wine prices dropped, too, in some cases a lot: a bottle of Oregon pinot noir listed for $72 in early February is now priced at $56. Perhaps the policy proved disconcerting to guests because the service is so wobbly, the food is uneven, and prices are, even now, steep. I wonder who Circadia’s audience will be. I arrived on a weeknight in the wake of two men wheeling suitcases who had just emerged from a town car. I sat at the bar, snagging the only seat left, mesmerized by the deep-blue lagoon of Brazilian agates embedded in its thick glass top, next to a group of plaid-shirted locals.